This post contains referral and affiliate links meaning that if you sign up for one of the apps discussed below, we may be compensated for that referral. The views expressed our ours alone and we do use these apps regularly for personal use. Looking for ways to reduce your grocery bill but don’t want to mess with the headache of coupons in the checkout line? If you have a smart phone, there is a better way. 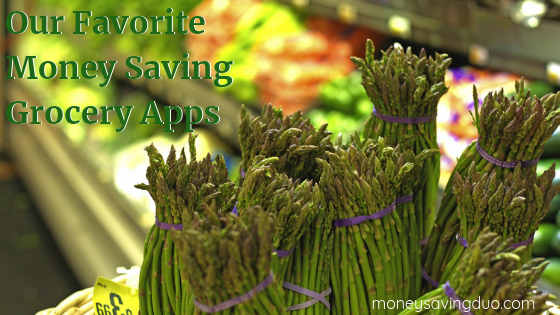 Take a look at our favorite apps that will help you save money with little extra effort. Over the years we’ve worked hard to get our grocery budget down. We use to spend ~$200 a visit, but now we tend to average about $115 a week. These apps let me save even more by providing cash back or rewarding me with gift cards I can use on future purchases. Ibotta. If you’re only going to download one app, this would be the one I’d suggest. I’ve cashed out the most often with the Ibotta app and I really appreciate how easy it is to use. Unlike other apps, Ibotta will often have “no brand” offers on things like milk, bread, eggs, produce and general receipts. This means you can get cash back for buying some of the basics. To date, we’ve used this app throughout the year and cashed out $237.21 in 2018. Want to give Ibotta a try? Sign up with our affiliate link and you’ll get $10 cash back when you submit your first receipt. Checkout 51. Checkout 51 works similarly to Ibotta in that it features various cash back offers on specific products. Offers are updated every Thursday and are often available in limited quantity. To be honest, the products featured typically aren’t the ones our family buys on a regular basis and sometimes the quantity required to purchase seems rather high, but every now and then we are able to find items and deals that do work for us. Checkout 51 has also offered cash for watching videos in the past, but hasn’t done so recently. To date, we’ve cashed out $92.10 in 2018 and have used the app throughout the year. Want to give Checkout 51 a try? Sign up through our affiliate link and you’ll get $5 when you redeem your first offer. Receipt Hog. Another one of my favorites is Receipt Hog. With this app, you don’t have to select individual items to claim rewards. Instead, you simply upload your receipt and receive coins for each one you upload. There is a limit on how many tokens you can receive each week, but I’ve only ever reached that threshold once. And every week you upload at least one receipt you’ll get a chance for extra coins by earning spins on the slot machine. You’ll also get additional opportunity for more coins as you level up. Occasionally Receipt Hog will give you bonus points for answering questions about a recent purchase. as well. To date, we’ve cashed out $25 and have been using the app since July. Want to give Receipt Hog a try? Sign up here. FetchRewards. This is another very easy app to use. Simply select which special offers you want to claim and select the brand names you typically purchase. When you scan your receipt you’ll get points for the items in your cart that fit under one of those brands or meet the criteria for your special offer. Every receipt you upload from the grocery store automatically gives you 25 points regardless of whether any specific items are present. Points can be redeemed for a variety of gift cards. We’ve only been using this app since August and have already redeemed $16 via Amazon, Target and Walmart combined. Its been a great way to save a little extra money on Christmas gifts this year. Want to give FetchRewards a try? Download at www.fetchrewards.com and use our referral code PD1CE to get 2000 points just for starting. ShopKick. If you enjoy scavenger hunts, this app is for you. You can get “kicks” for walking into certain stores and for scanning bar codes on various items. This means it is possible to get rewards without having to actually make a purchase; however, if you happen to purchase the items you scan, you’ll get even more kicks to play with. Kicks can be exchanged for gift cards… or a Vespa. We’re always curious if anyone has scored enough kicks for that. We tend to use our kicks to redeem gift cards. Want to give ShopKick a try? Use our referral code SHOP307617 when you download it and you’ll get 250 kicks once you scan your first item or complete a walk-in. 500 kicks = approximately $2. Drop. This app is a little unique in that you don’t have to upload any receipts. Instead, you link your credit card and choose 5 stores or restaurants you frequent. Whenever you use your linked card to make purchases at those places, you’ll receive a certain number of points for every dollar you spend. Bonus – once you’ve claimed 5 deals, you get to score bonus points by playing a Snake game! Aaron was made for this app. We chose Target, Bath and Body Works, Starbucks, McDonalds, and Chipotle for our five core destinations. But other offers come in from time to time as well. So far we’ve earned about $23 back through this app which can be redeemed through a variety of gift cards. Want to give Drop a try? Use our referral code x4u82 to sign up and get 5000 points (equivalent to $5) when you link your first card. Have used any of the above apps to get cash back or redeem gift cards? Which is your favorite? We’d love to hear about it in the comments.